INTRODUCING SOUTHERN GOSPEL NEWS: SouthernGospelNews.com and its sister online publication, ArkLaTexNews.com, were many years in the making and launched under the direction of Executive Editor Randa Thornton-Mason (see biography below) on April 9, 2019. The concept was initially developed in 2015 with the idea of establishing a news organization for the ArkLaTex that covered both hard news and the arts for the region including Northeast Texas, Southwest Arkansas, North Louisiana and Southeast Oklahoma. OUR CHALLENGE: The ArkLaTex has a population of more than 1 million people, and the geographic area it covers is vast. The popularity of music styles varies greatly, but Southern Gospel Music and Country Gospel are some of our region's most popular music genres. In addition, our demographic and economic research showed our local communities in the Four States area wanted more information about Southern Gospel Music and more Gospel concert options as well. This exciting discovery led to a critical question: How do we effectively cover Southern Gospel on a local level but still offer interesting Southern Gospel and Country Gospel news and information for national and international readers? REACHING OUT TO THE COMMUNITY: To cover Southern Gospel Music in the ArkLaTex fairly and evenly, we decided to create local "hubs" to distribute news. This would allow us to produce "hyperlocal" or "very local" news for the important communities of our region. At the same time, we will offer charts and music reviews of new Southern Gospel albums and singles on SouthernGospelNews.com. An added benefit is that our effort could spur an increase in music sales and expand tour dates for local concerts of Southern Gospel music as more ArkLaTex citizens become further educated about the hard working groups, artists and musicians. SOUTHERN GOSPEL MUSIC MATTERS: Above all else, we want to be sure we effectively report on Southern Gospel Music. The genre that gave us The Cathedrals, Gold City, The Happy Goodman Family and The McKameys has branched out to include more diverse influences, such as elements of country, bluegrass and folk. We want to respect and honor classic Southern Gospel music while also offering news and perspectives on other Roots Gospel artists who establish innovation with songs and writing within the category. 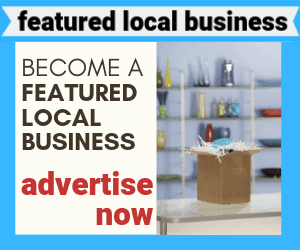 HASSLE-FREE, BUSINESS-FRIENDLY ADVERTISING: We want to provide exceptional value to local businesses. 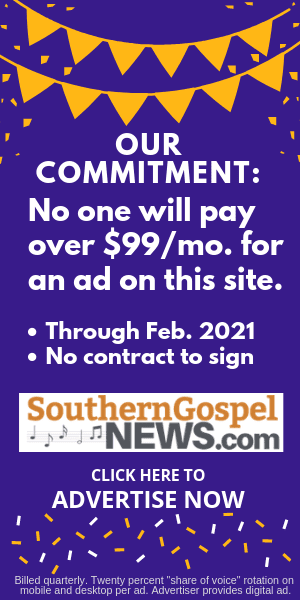 Therefore, we're making a bold commitment: No one will pay more than $99 per month for any ad on SouthernGospelNews.com through February 2021. There's no contract to sign, and businesses or artists with new albums or concerts can easily advertise directly on SouthernGospelNews.com. Click here to advertise now for best placement. Space is limited. SOUTHERN GOSPEL NEWS AND THE WAY FORWARD: Our mission is simple: We want to provide relevant, interesting news and information for fans and potential fans of Southern Gospel music. We also want people in other areas of the ArkLaTex (and beyond) to learn more about Southern Gospel music and this wonderful genre of music - while doing our part to promote local music artists, review new music and expand opportunities for Southern Gospel concerts and events. Randa Thornton-Mason has a lengthy history of community service and business activity in the Ark-La-Tex. Before coming here, she attended Hardin-Simmons University in Abilene, Texas and worked as a bank and corporate retail auditor. As the wife of a US serviceman, she was employed in Germany by American Express Bank. 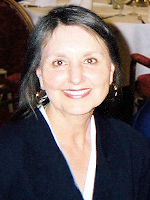 After making a decision to establish roots in the Ark-La-Tex, Mrs. Thornton-Mason served as PTA president for area elementary and junior high schools. An avid painter, she was also named Cultural Arts Chairman for Texarkana ISD schools. For more than seven years, she served as director for a local ministry with five buses that brought children from Texas and Arkansas to church services and functions. She also wrote a weekly newsletter column about her experiences. In business, Mrs. Thornton-Mason served on the Board of Directors of Central Mall for more than 15 years. She owned and managed a Christian bookstore for over two decades and owned a seasonal Christmas store for 15 years. She also held and operated a James Avery jewelry franchise for more than two decades until James Avery retired from franchising and she retired from business in the early 2000s. Mrs. Thornton-Mason later worked as a business development consultant to help international Christian bookstores in Europe achieve better marketing and product distribution. She also helped operate annual international conventions in Amsterdam. On the internet, Mrs. Thornton-Mason distinguished herself in the mid-1990s by becoming a full partner of a top national Christian retail website that still successfully operates today. Although she humorously describes herself as somewhat of a technophobe, she also helped create and finance other websites in the 1990s which were later acquired and merged with other companies. She looks forward to using her years of experience in business, community service, journalism and the arts to fulfill her new mission of bringing local news, information and increased visibility to our Ark-La-Tex region.